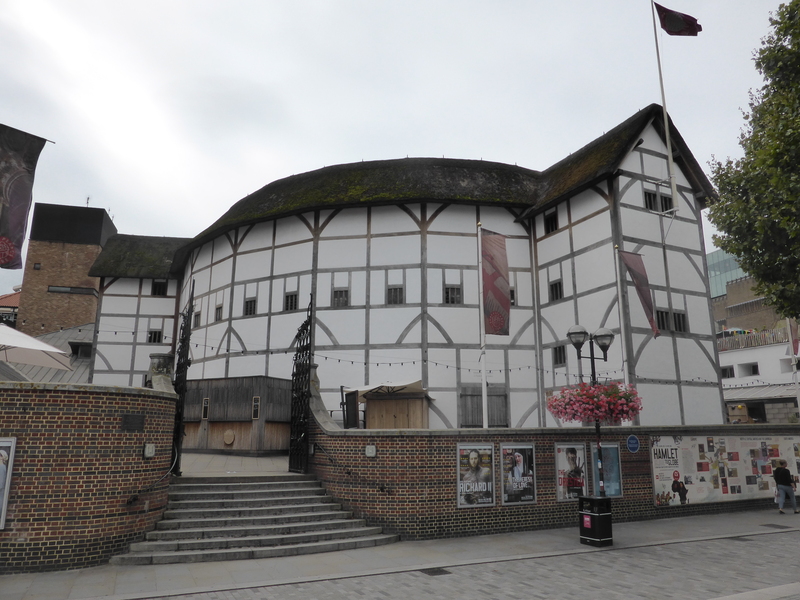 The other weekend Sarah and I visited Shakespeare’s Globe Theatre on the south side of the River Thames in London – between the Millennium Bridge and Southwark Bridge – both of which are between Blackfriars Bridge and London Bridge. Shakespeare’s Globe Theatre was originally built in 1599, destroyed by fire in 1613, rebuilt in 1614, and then demolished in 1644. The modern reconstruction is based on available evidence of the 1599 and 1614 buildings. 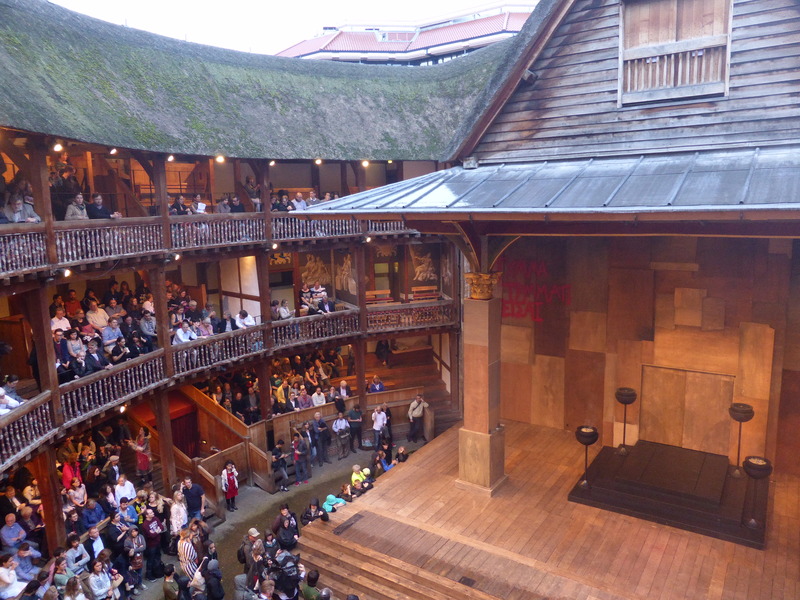 It was founded by the American actor and director, Sam Wannamaker (Zoë‘s dad), almost on the site of the original theatre, and opened in 1997. Interestingly we went to see a variation on Aeschylus’ Oresteia, the ancient Greek play – nothing to do with Shakespeare! However, as you do, we wandered around the area and what we found, within no more than a 5 minute walk, was quite fascinating. If you hear the phrase “he’s in the clink” you think of someone in prison. But where does the phrase come from? 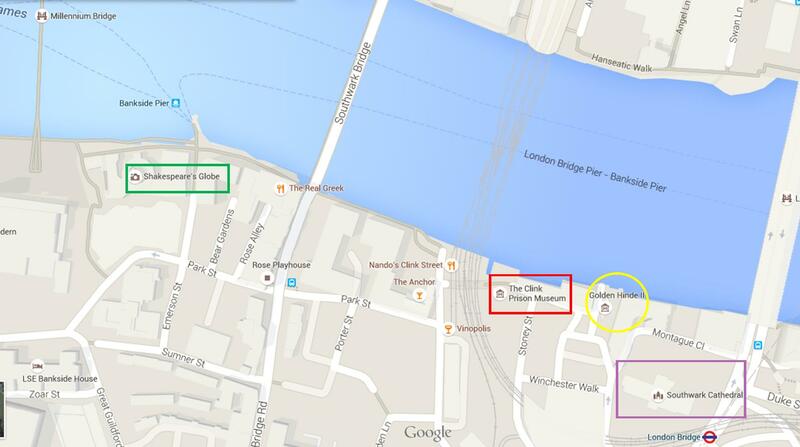 If you walk eastward from the Globe along Bankside you come into Clink Street – and the answer to the question. Here you will find the Clink Prison Museum. The Clink Prison is the name given to all prisons that have stood on a number of sites around this particular vicinity over the years. 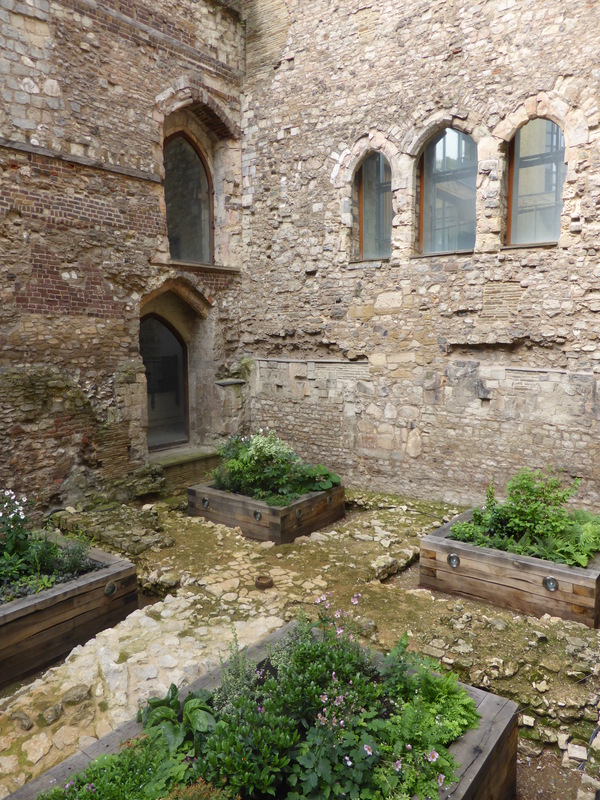 The first prison dates back to 1127 and was a cellar in the Palace of the Bishop of Winchester (see below). The last was in Deadman’s Place – now Park Street (immediately southwest of Clink St) – which, at various times, held Protestant and Catholic religious martyrs. It was burned down in 1780 by anti-Catholic Gordon rioters (see Charles Dickens’ 1841 novel, Barnaby Rudge). 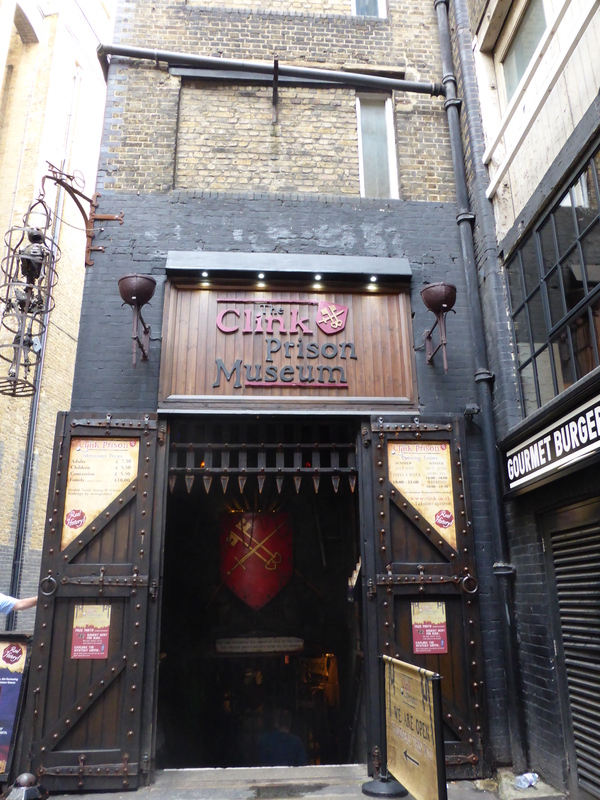 The Clink Prison Museum – enter at your own peril….! Just along from the prison (still going east) is the remains of Winchester Palace. This was the palace of the powerful Bishops of Winchester which was one of the largest and most important buildings in medieval London. It was founded in the 12th century (around 1136) by Bishop Henry de Blois, brother of King Steven. Its purpose was to house the bishops in comfort whilst they were staying in London on royal or administrative business. 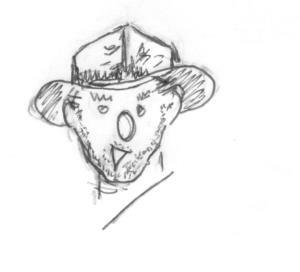 And why not. 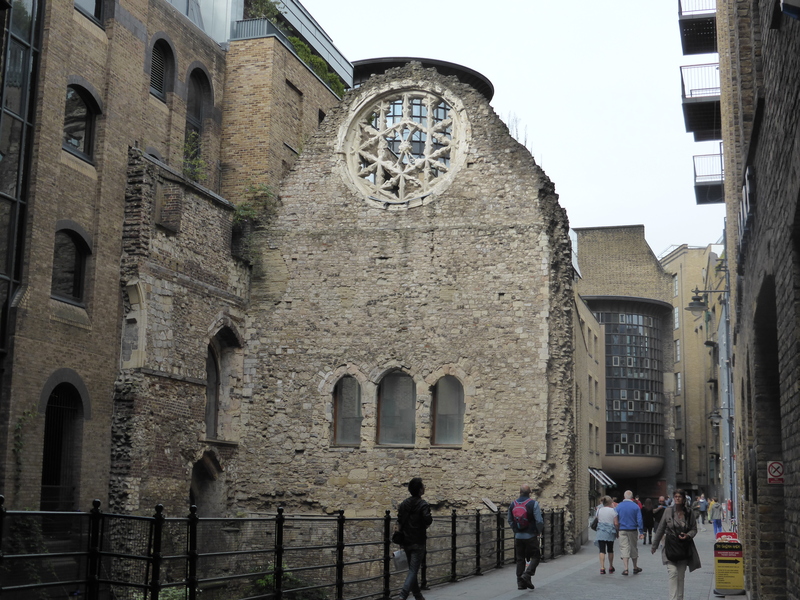 The visible remains (above) were part of the Great Hall which formerly stood alongside the south bank of the Thames. You can see the magnificent rose window at the top. Below it are three glass ‘windows’ which were, in fact, entrances leading to the buttery, pantry and kitchen. Below the hall was a vaulted cellar where goods such as wine could be stored, with a passage to the river wharf. The palace remained in use until the 17th century when it was divided into tenements and warehouses. It was destroyed by fire in 1814 and then rediscovered in the 1980s during redevelopment of the area. 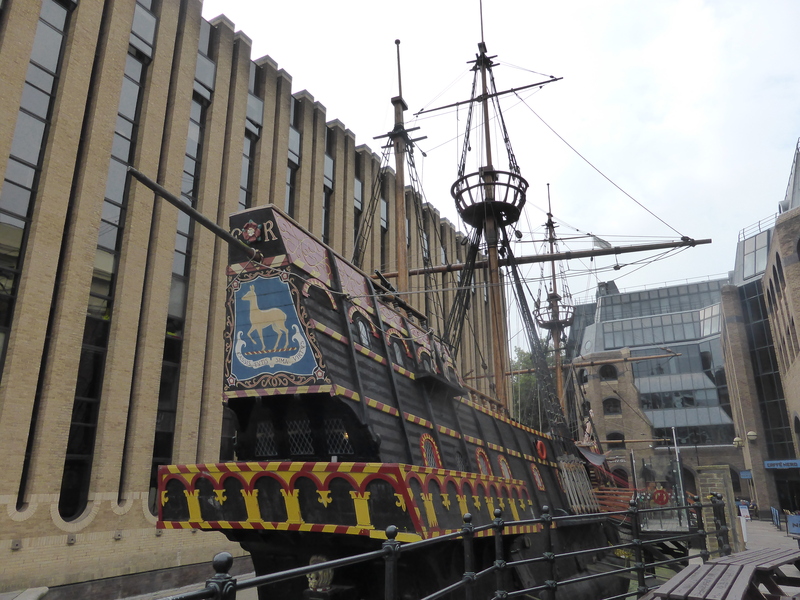 Along from the palace is the replica of Sir Francis Drake’s Golden Hinde. The original ship dates back to the 16th century when it circumnavigated the globe between 1577 and 1580 during the reign of Elizabeth I. The Golden Hinde II took two years to build and, as there were no plans of the original ship, Loring Christian Norgaard, a Californian naval architect, spent three years researching manuscripts about Drake’s voyage, Tudor shipbuilding techniques, and the journals compiled by crew members. 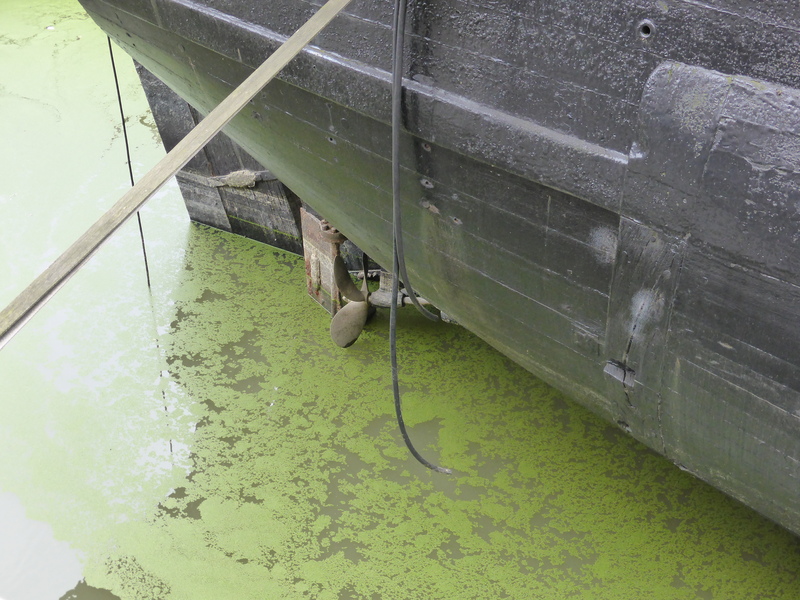 The replica was launched in April 1973 from the J. Hinks & Son shipyard in Devon. From Winter 1974 to Spring 1975 the ship sailed from Plymouth to San Francisco to commemorate the upcoming 400th anniversary of Francis Drake’s discovery of Nova Albion in North America in 1579. She returned to England in 1980. 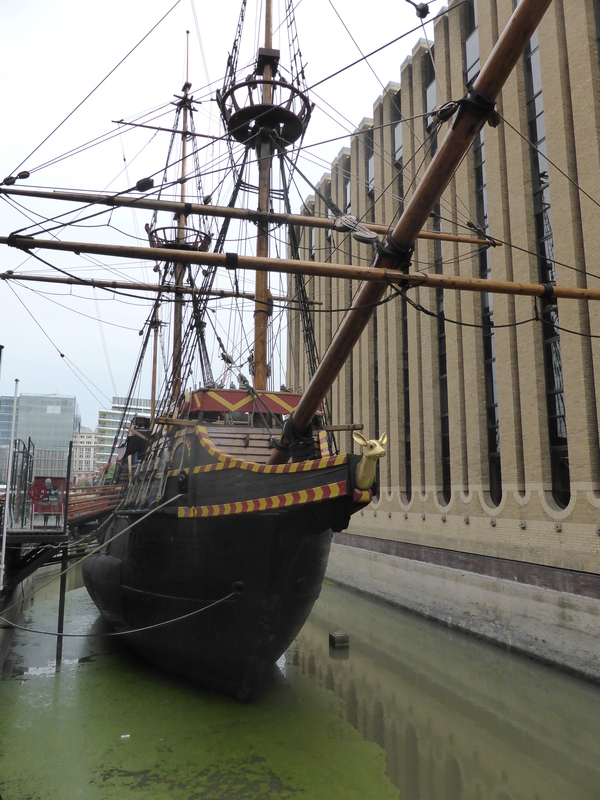 After a tour of Britain and Ireland, Golden Hinde II sailed to Canada to appear in Expo ’86, and a year later began a four-year expedition along the East and West Coasts of North America, returning to the UK in 1991. Following another successful tour, she finally settled down in her current home at St Mary Overie Dock in 1996. I don’t wish to be a spoil-sport but if you are in any doubt as to whether she really is a replica check out the propeller! 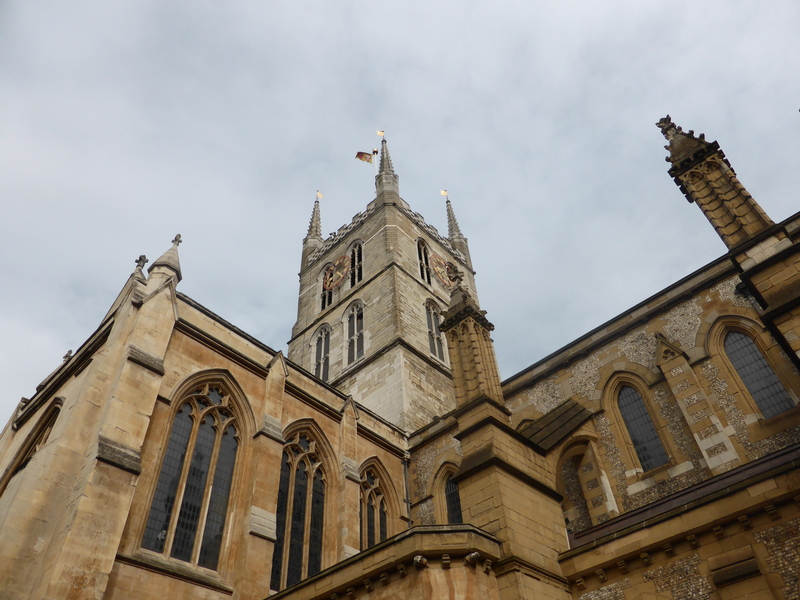 Finally, just around the corner from the Golden Hinde II is Southwark Cathedral. This began its life in AD 606 as a convent. 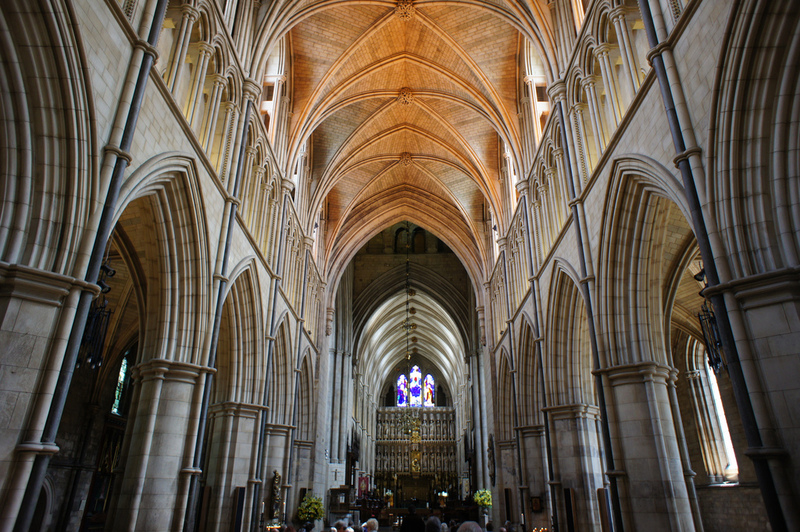 Around the 9th century, the Bishop of Winchester may have replaced the nuns with a college of priests. In 1106 the church was ‘re-founded’ by two Norman knights as a priory, living according to the rule of St Augustine of Hippo, dedicated to St Mary. After the dissolution of the monasteries in 1539 it was appointed a parish church and renamed St Saviour’s. 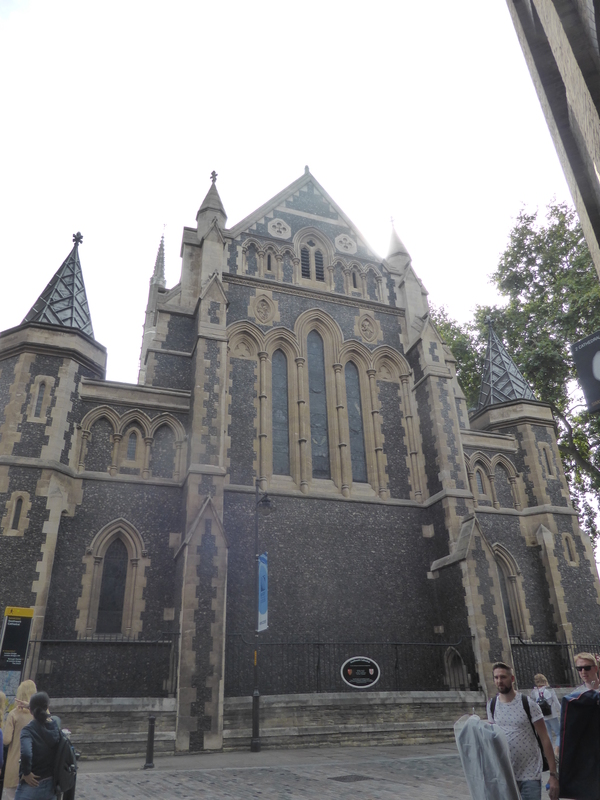 It became Southwark Cathedral in 1905. My large friend, Paramount Hargrove, told me he had discovered that he had the body of a Greek god. I had some difficulty trying to explain to him that Buddha is not Greek.